Unfortunately, things aren’t always easy, but several strategies help you stay on top of things. It might help to talk about the worst-case-scenario first. If you stop paying on a loan, you eventually default on that loan. The result: You’ll owe more money as penalties, fees and interest charges build up on your account. Your credit scores will also fall. It may take several years to recover, but you can ​rebuild your credit and borrow again—sometimes within just a few years. Debtors' prisons were outlawed in the U.S. long ago, so you don’t need to worry about debt collectors’ threats of sending the police out tomorrow. However, you do need to pay attention to legal documents and requirements to at least appear in court. That’s the worst that can happen. It’s not fun—it’s frustrating and stressful—but you can get through this, and you can avoid the worst-case-scenario. Pay late: It’s best to make loan payments on time, but if you can’t do that, slightly late is better than really late. Try to get your payment in within 30 days of the due date. In many cases, those late payments are not even reported to credit bureaus, so your credit will not be damaged. This leaves you the option of consolidating or refinancing debt. Consolidate or refinance: You might be better off with a different loan. Especially with toxic loans like credit cards and payday loans, consolidating with a personal loan results in lower interest costs and a lower required payment. Plus, a new loan typically gives you more time to repay. For example, you might get a personal loan that you repay over three to five years. Taking longer to repay might end up costing you more in interest—but it might not. Especially when getting out of payday loans, you could easily come out ahead. Apply before you start missing payments to qualify for a new loan. Lenders don’t want to approve somebody who’s already behind. Where should you borrow? Start by applying for unsecured loans with banks and credit unions that work in your community, and online lenders. Apply for these loans at the same time so you minimize damage to your credit and go with the best offer. Try secured loans: Consolidating with a secured loan can help you get approved if you want to pledge assets as collateral. However, you risk losing those assets if you can’t make payments on the new loan. If you put your house on the line, you could lose it in foreclosure, making things difficult for you and your family. Having your vehicle repossessed may make it hard to get to work and earn income. Communicate with lenders: If you foresee trouble making payments, talk with your lender. They might have options to help you, whether it’s changing your due date or letting you skip payments for several months. You might even be able to negotiate a settlement. Explain that you can’t make the payments, offer less than you owe, and see if they accept. This isn’t likely to succeed unless you can convince your lender that you’re unable to pay, but it’s an option. Your credit will suffer if you settle, but at least you put the payments behind you. Prioritize your payments: You might need to make difficult decisions about which loans to stop paying and which ones to keep current on. Conventional wisdom says to keep making payments on your home and auto loans, and to stop paying unsecured loans (like personal loans and credit cards) if you must. The rationale is that you really don’t want to get evicted or have your vehicle repossessed. Damage to your credit is also problematic, but it does not instantly disrupt your life in the same way. Make a list of your payments, and make a conscious choice about each one. Make your safety and health a priority as you choose. If you borrowed for higher education through government loan programs, you might have extra options available. Loans that are backed by the federal government have benefits that you can’t find elsewhere. Deferment: If you qualify for a deferment, you can stop making payments temporarily, giving you time to get back on your feet. For some borrowers, this is an option during periods of unemployment or other financial hardship. Income-based repayment: If you don’t qualify for deferment, you might be able to at least lower your monthly payments. Income-driven repayment programs are designed to keep payments affordable. If your income is extremely low, you end up with an extremely low payment to ease the burden. Payday loans are unique because of their extremely high costs. Those loans can easily send you into a debt spiral, and eventually, the time will come when you can’t make your payments. Consolidating payday loans is one of your best options when you can’t pay them off or sell anything to drum up cash. Shift the debt to a less expensive lender—even credit card balance transfers can save you money and buy you time. Just be mindful of balance transfer fees, and don’t use the card for anything except paying down the existing debt. If you already wrote a check to a payday lender, it might be possible to stop payment on the check to preserve funds for higher-priority payments. However, this can lead to legal troubles, and you still owe the money. Speak with a local attorney or legal advisor familiar with the laws in your state before you stop payment. Even if it’s an option, you’ll have to pay a modest fee to your bank. Skipping payments on a credit card also requires special attention. If possible, at least make the minimum payment, although more is always better. When you stop making payments, your credit card issuer can raise your interest rate to a much higher penalty rate. This may make you re-evaluate the priority of which payments to skip and which ones to pay. You might think that you can’t afford to get help if you’re having trouble with loan payments. But you’re not necessarily on your own. Credit counseling can help you understand your situation and come up with solutions. An outside perspective is often helpful, especially from somebody who works with consumers like you every day. The key is to work with a reputable counselor who’s not just trying to sell you something. In many cases, counseling is available at no cost to you. Depending on your situation, your counselor may suggest a debt management plan or another course of action. Start your counselor search with the National Foundation for Credit Counseling (NFCC) and ask about fees and philosophy before you agree to anything. Bankruptcy attorneys can also help, but don’t be surprised when they suggest filing for bankruptcy. Bankruptcy could solve your problems, but there might be better alternatives. Public assistance is also available in many areas. Local utilities, the federal government, and others provide relief to people who need help paying bills. 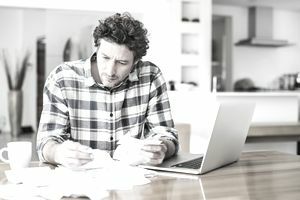 These programs could provide enough relief to help you stay on top of your loan payments and avoid more drastic measures. Start your search at USA.gov and ask your local energy and telephone providers about available programs. So far we’ve covered short-term fixes. Ultimately, you need a long-term plan to stay on top of the bills. Life is less stressful when you don’t have to constantly put out fires, and ideally, you can move on to fund future goals. Emergency fund: It’s essential to have emergency savings. Whether it’s $1,000 to get you out of a jam, or three months’ worth of living expenses, some extra cash helps you avoid problems. You don’t need to borrow when something breaks, and you can pay bills without interruption. The primary challenge is building your emergency fund, which requires spending less than you earn. Understand your finances: You need a firm grasp on your income and spending to be successful. Track every penny you spend for at least one month—longer is better. Remember to include expenses you only pay annually, such as property tax or an insurance premium. You can’t make smart decisions until you know where your money goes. You might have to earn more, spend less, or both. For quick results, the most common solutions include taking on extra work, cutting spending, and selling items you no longer need. For longer-term success, work on your career and spending habits that can pay dividends for many years to come.